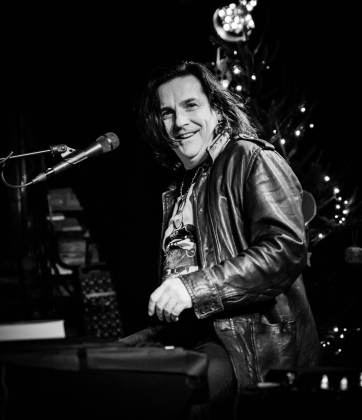 Buckley's, a blues club in Oslo, provided the candlelit stage for two nights of Steve Hogarth's (h) "Family Tree" tour on 5th and 6th December. 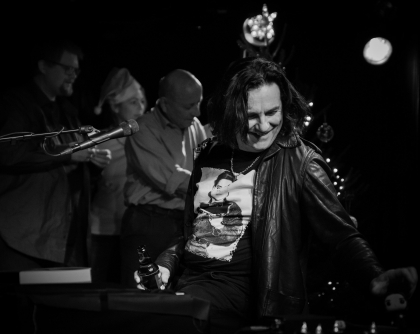 The venue was transformed into an intimate family living room at Christmas time, complete with 'h' shaped biscuits, tea, and a Christmas tree on stage, which h invited members of the audience to decorate throughout the gigs ("Has anyone brought a bauble?"). There was no wall between performer and audience - everyone shared one space. h was candid and raw. He confessed to being a little nervous about performing alone in such a small space without really knowing how the evening would unfold, but said the "terror was built in". This is a particularly special feature of h's concerts - he has a large repertoire to choose from and also takes audience requests, so no concert is the same. Expect the unexpected - such as an impressive spontaneous performance of a-ha's "Take on Me". h added to the seasonal atmosphere by sharing amusing anecdotes from his diaries, telling tales of his encounter with Björk in Iceland and having Neil Armstrong, who had survived many dangerous journeys, in the back seat of his car while driving around 100mph. "It would be a shame if I were the one to kill him". The crowd were warmed by "The Christmas Song" and Marillion classics such as "Easter" and "Fantastic Place" and roused by impassioned performances of "Ocean Cloud" and "Sky Above the Rain", during which h seemed to feel every word. They were also lulled by the poetic performance of "The Deep Water" from h's solo album "Ice Cream Genius". As with many family Christmases, a range of emotions were experienced. The nerves were needless. There was only one star on stage at Buckley's and it wasn't the one on top of the tree.